Long sleeves. 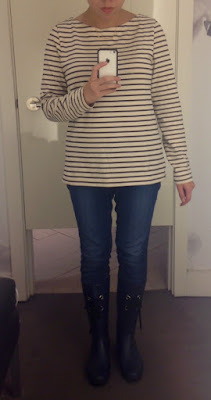 I typically like three-quarter sleeves and think they're flattering, which is maybe partially a product of being a bit too wide-shouldered for petite tops while still having slightly too-short arms for some regular long-sleeved tops. 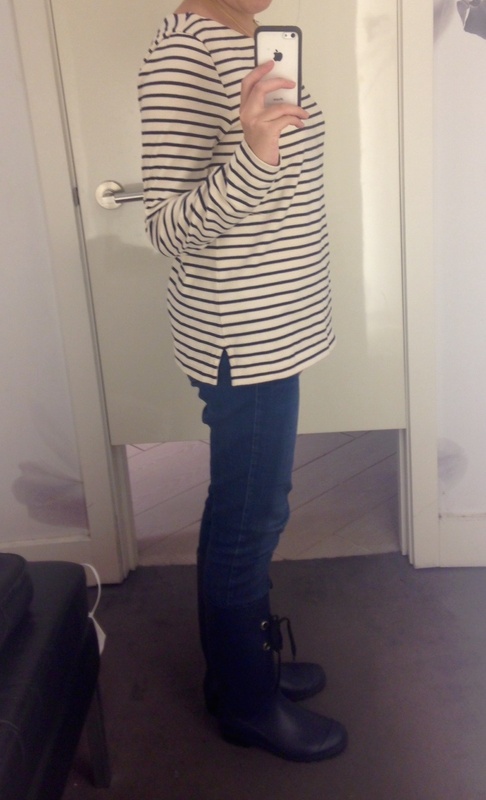 Either way, my other striped top has three-quarter sleeves, so I wanted to mix it up. There was a newer design at Uniqlo that fit most of my other criteria, but the sleeves were awkwardly long with excess length extending to at least the base of my thumb. That sleeve length was especially strange relative to the shorter than expected length of the shirt. Boatneck preferred. 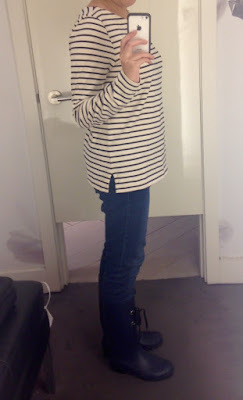 I find boatnecks flattering, though I sometimes have issues with a bra strap showing. (Most of my bras have fairly thick straps, and they can peek out of a wider boatneck unless I push them a little off-center.) Round and crew necks can sometimes be very unflattering on me by emphasizing my chest in an awkward way, though I was ready to look at round neck shirts at Saint James. Thick cotton fabric. I wanted something made to imitate the classic Saint James shirts, which are made of a heavier cotton fabric, which results in a shirt that is good for spring and fall, but isn't really suitable for, say, a NYC summer. Stripes must be woven in, not printed. 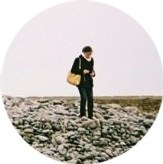 Back when I first started looking, I browsed regular J. Crew as well, and one of their only striped tee designs available at the time had printed rather than woven-in stripes. (You can see from the photo, where the inside of the shirt is visible, that the stripe is not woven in to the fabric.) That felt a bit cheap to me. This J. Crew Factory Long-Sleeve Striped Boatneck Tee was backordered for a while, and I received it right at the end of September, after I'd already compiled my budget post. I first saw it on Franish several months ago, and I vaguely thought about buying it then, but I had just bought that other striped top. Now that I have it in my hands, I find that I really like it, and I've already decided to keep it, so it will be listed in the next budget post. It fits all the criteria I had in mind. I ordered both the small and the medium, and I'm wearing the small above. On me, the small has a slightly relaxed fit that still skims pretty close to my body. The boatneck is narrow enough that I don't have too much trouble with bra straps peeking out. The sleeves hit a bit past my wrist, but aren't as awkwardly long as the ones on that Uniqlo top I tried. The cotton is a bit thinner than I was envisioning, but it is the same type of thicker cotton fabric that I had in mind.